How cool is this, a LEGO City playset that's perfect for Christmas! Let it snow with the Arctic Base Camp set, everything your kids need for their very own 'frozen' adventure, including a research laboratory, exploration vehicle and helicopter. The Lego City playsets have been bestsellers ever since they were first released, perhaps because they allow kids to use their imaginations to the max to create their own real-world adventures, rather than being led by film-themed sets or fantasy sets with strong back stories. Head out into the wilds and set up the hi-tech LEGO City Arctic Base Camp to explore the secrets of the ice! Set out on major expeditions with the snow scooter and husky sled team. Investigate the secrets of the ice with the powerful tracked exploration vehicle. Call for helicopter back-up and deploy the winch and net to carry large blocks of ice back to base. 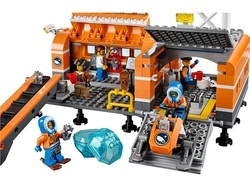 Transfer the mysterious crystals into the laboratory on the conveyor belt and open the walls and roof of the lab for easy play. Help the scientist and research assistant analyse your findings with the 2 computers, microscope and other equipment. Then relax in a cozy corner of the garage and watch TV before lowering the door, driving out on the snow scooter and beginning another research mission. But beware - this is a dangerous place with extreme weather conditions and a polar bear lurking near the camp!.